Google Shopping Ads can help boost your overall sales and cost per profit. We have multiple startups to large-scale E-commerce stores with $10K-500K a month in ad spend. All our E-commerce PPC packages are specially designed for websites with SKUs. We can help drive sales traffic directly from Google Search results to your product page and provide you detailed insights from query to landing pages, to conversions to abandoned /checkout carts and so on. Full Audit, Performance Report & Call/Chat. We will place the optimized feed product ads in a google search, search network, targeted display network and remarketing. We will make sure your highly profitable products get the highest conversions at least cost possible. We filter, audit and optimize the data feed for better visibility and a good score. We make sure it has enough details to get better visibility, get high CTR and conversions to sales. We generate and optimize data feeds for Shopify, Woocommerce, Custom E-commerce stores, and also use third party data feed tools like GoDataFeed, FEeditor, Freedonomics and more. We will setup remarketing campaigns to make sure your past website visitors, your email subscriber lists as well as prospective customers who added products to Cart but abandoned for any reason. This will help bring the conversions back from to be dead traffic/lead to a customer who just wanted to decide later. We will make sure wherever your website’s past users/visitors go, they keep on seeing your ads or the products they browsed on your site. No Matter you already have one account or you want us to setup a new. We will provide you access to your account which will remain with you. - Do you have custom ecommerce / google shopping ads management pricing? We offer custom pricing for accounts as per needs and budget. Please get in touch with us for more details. - How your reporting process works? We offer monthly before after and performance report as well as Weekly Auto reports. We can also offer fully custom reports to clients with high spend or large number of accounts. - Can I resell Google Shopping PPC Management Services? Yes, you can upprice the discounted ppc reseller packages and boost your overall profit. We offer white label reporting and support, as well sign NDA to make sure each of your client remains under your brand. 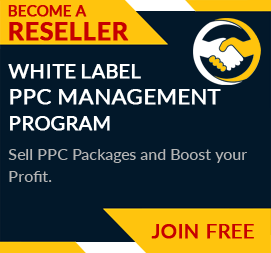 Sign up to become ppc reseller here or contact us for more details. We have witnessed a considerable increase in the website’s traffic ever since we collaborated with PPCPapa. Its remarketing campaign helped us retain our old clientele as well.